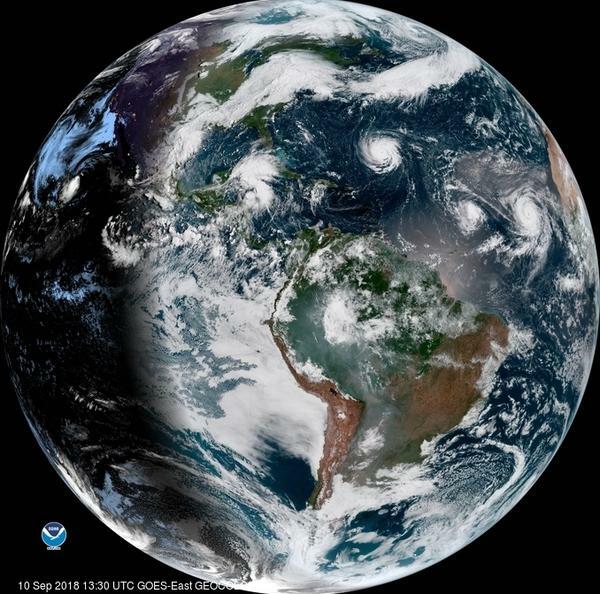 A satellite image from Monday shows Hurricane Florence as it travels west and gains strength in the Atlantic Ocean. Hurricanes Isaac and Helene have also formed off the coast of West Africa. Hurricane Florence is moving relentlessly toward the Southeastern U.S. It's a large, powerful cyclone that will likely bring storm surge and high winds to coastal communities. But climate scientists say one of the biggest threats posed by Florence is rain. "Freshwater flooding poses the greatest risk to life," explains James Kossin, an atmospheric scientist for the National Oceanic and Atmospheric Administration and the University of Wisconsin, Madison. And Florence could cause extensive freshwater flooding for two reasons. First, Florence is moving slowly and could all but stop when it reaches land. "The storm could be over North Carolina and traveling incredibly slowly — on the order of just a few miles per hour," explains Kossin, who says an official from the city of Charlotte, N.C., contacted him about rainfall projections for that city. If Florence stalls over the Southeast, it would be reminiscent of Hurricane Harvey, which spent days dumping rain on the Houston region last year. Some areas ended up with more than 60 inches, a catastrophic amount of water that shut down the entire region and resulted in at least 93 deaths. Slow-moving storms like Harvey are getting more common. A study published earlier this year by Kossin found that tropical cyclones around the world have slowed down 10 percent in the past 70 years. "We're seeing that in every ocean basin except the northern Indian Ocean," says Kossin, possibly because climate change is causing the wind currents that hurricanes ride to slow down. If Florence slows down and stalls when it hits land, it will be the latest example of that trend. Kevin Trenberth of the National Center for Atmospheric Research in Boulder, Colo., says global warming also affects the size and intensity of storms like Florence. "We have global warming, and so this actually makes these storms bigger and more intense," he explains. Humans burn fossil fuels in our cars, our power plants and our airplanes, all of which release greenhouse gases that trap heat. Warmer oceans, especially, provide fuel for hurricanes in the form of evaporating moisture. "The oceans are warmer now than they've ever been, and they're going steadily upwards," Trenberth explains. In a study published in May, he and colleagues found rain from Hurricane Harvey was powered by the highest ocean temperatures ever recorded in the Gulf of Mexico. Right now, the part of the Atlantic under Florence is slightly warmer than usual, and the area north of the storm is significantly above normal, he says. Together, the increased size and the slower forward motion of storms like Florence spell potential flood disaster for communities in their path. Florence could be like a faulty sprinkler, stuck watering one area for days on end. "This idea, first of all, of a very strong hurricane making landfall is always going to be very, very bad news," says Kossin, "but then adding the potential for it to stall out once it hits land — that's a very, very frightening prospect to think about." Hurricane Florence, which is approaching the Carolinas, is another strong storm. Hurricanes are measured by wind. This one has had recorded speeds of up to 140 miles per hour. But whenever it makes landfall, the real danger may be rain. That's what happened with Hurricane Harvey last year in Texas. NPR's Rebecca Hersher has covered that storm's devastating aftermath and now is watching the approaching storm. REBECCA HERSHER, BYLINE: James Kossin is a climate scientist who specifically studies hurricanes, typhoons - big, scary, swirly storms. And so far, this hurricane season has been pretty quiet - until now. JAMES KOSSIN: There's so many hurricanes going on right now; it's almost hard to keep up. HERSHER: There's Hurricane Olivia in the Pacific, two more storms brewing off West Africa, and then, there's Hurricane Florence, which is projected to hit the East Coast later this week. KOSSIN: This is a incredibly dangerous storm. HERSHER: One reason it's dangerous - it's not moving very quickly. KOSSIN: The storm could be over North Carolina and traveling incredibly slowly on the order of, you know, just a few miles per hour, even, which is getting to the kind of speeds that we saw with Harvey. HERSHER: Last year, Hurricane Harvey stalled around Houston. It just wouldn't move for days, so it kept raining and raining - 60 inches in some places. Earlier this year, Kossin published a study that shows storms are moving more slowly around the globe. One reason may be that climate change is causing the big currents of wind that hurricanes ride on to slow down. If Florence stalls over the East Coast, it would be another example of that slowing trend. Kevin Trenberth of the National Center for Atmospheric Research in Boulder, Colo., says climate change also affects another feature of Florence - it's enormous. KEVIN TRENBERTH: We have global warming, and so, this actually makes these storms bigger and more intense. HERSHER: How? Well, we - all of us - burn fossil fuels, produce greenhouse gases that trap heat. TRENBERTH: And so there's more heat in the system. And so the oceans are warmer now than they've ever been, and they're going steadily upwards. HERSHER: Warm oceans are like a steaming bath, and evaporating moisture from that bath is the fuel for storms. So hotter oceans mean bigger, wetter hurricanes. In fact, earlier this year, Trenberth and colleagues published a study that found record-high temperatures in the Gulf of Mexico, as high as 86 degrees Fahrenheit, helped make Harvey into the rain monster it became. The amount of water that evaporated up into the hurricane as it formed matched the amount that fell all over Texas. And Trenberth emphasizes that in a storm like Harvey or Florence, the most dangerous thing is rain. TRENBERTH: People should take these warnings very seriously because the risk of flooding, in particular, in some areas is very real. KOSSIN: The freshwater flooding poses our greatest risk to life. And this idea of a - first of all, of a very strong hurricane making landfall is always going to be very, very bad news. But then, to combine that with the potential for it to sort of stall out once it gets over land - that's a very frightening prospect to think about that. HERSHER: Rebecca Hersher, NPR News. (SOUNDBITE OF COOPER SAMS' "ADRIFT") Transcript provided by NPR, Copyright NPR. 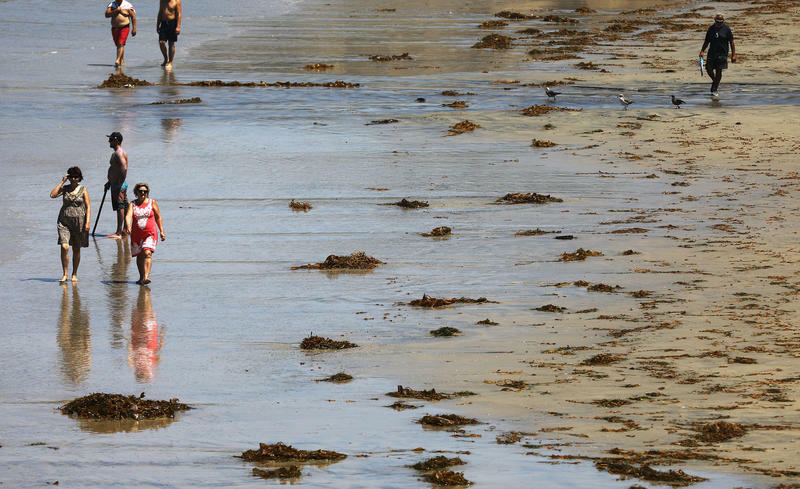 Sea surface waters off the Southern California coast are setting records for warmth this summer. Last week, the Scripps Institution of Oceanography in San Diego recorded its highest ocean temperature ever, 79.2 degrees. Here & Now‘s Robin Young asks Daniel Rudnick, professor of oceanography at Scripps Institute of Oceanography, what’s going on.